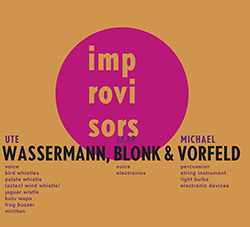 Blending two of the most unconventional voices on the planet--Ute Wasswerman and Jaap Blonk--with percussionist Michael Vorfeld, also on string instrument, light bulbs and electronic devices, Wasserman adding voice, whistles, kutu wapa, frog buzzer, and mirliton, and Blonk adding electronics; wonderfully eccentric while impressively informed and masterfully executed. 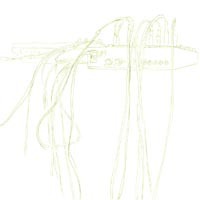 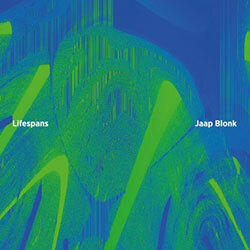 As he delves further into electronics, Netherlands vocal improviser and experimental artists Jaap Blonk finds an ever-increasing array of approaches to modify his voice and set it into alien and astounding environments, here in 16 tracks of musique concrete, sound poetry, pulse based electronics, soundscapes, and inexplicable hybrids of the same. 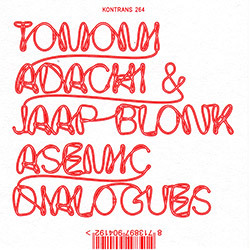 Performing together since 2004 between Tokyo and Amsterdam, Dutch vocal improviser, innovator and electronicist Jaap Blonk meets Japanese vocal improviser and fellow electronics artist Tomomi Adachi at Lettretage in Berlin in 2017, recording this, the 5th in Kontrans' Electronic Improvisation, for two extended and energetic dialogs of unique creative interplay. 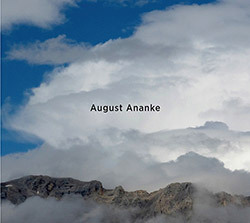 Ex guitarist Terrie Ex improvises with Dutch sound poet and electronicist Jaap Blonk for 9 stories and sonic works, using unusual phonetic interpretations in strange stories with electronic asides and interventions, a truly unique album drawing on the evolution of their duo since 2012 that includies performances in Ex's Ethiopian "Soundpoetry" series of concerts and workshops. 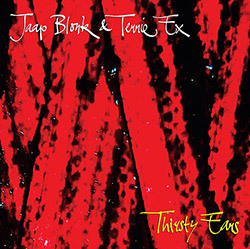 An amazing album of vocal utterance and layered sound from Dutch improviser and experimenter Jaap Blonk, using spatial placement and movement extended by electronic means to focus on phonetic concepts, particularly the diphtong and approximant. 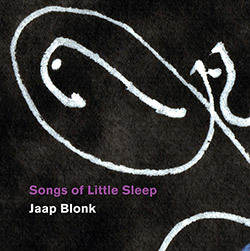 Dutch vocalist and electronic artist Jaap Blonk takes on insomnia in 13 short works celebrating sleeplessness, including one piece for Dada sound poet Raoul Hausmann, and other "songs" using effective electronics and bizarre vocal utterances to accompany your own sleepless nights. 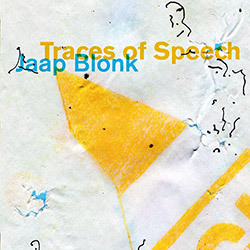 Sound poet Jaap Blonk extended the International Phonetic Alphabet (IPA) into BLIPAX (Blonk's IPA Extended), developing scores as drawing which are converted into electronic sound through audio software and then back to text through OCR to create these unusual spoken audio pieces. 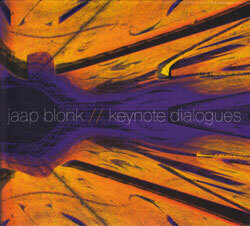 Eight meditations on just intonations from electroacoustic artist and vocalist Jaap Blonk, here focusing on instrumental aspects while creating beautiful environments of serene and shimmering sound. 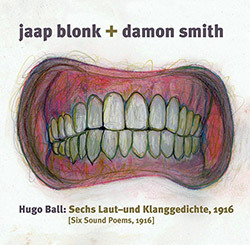 Three free improvisations for voice & double bass + improvisations on Hugo Ball's Six Sound Poems from the duo of free improvising vocalist Jaap Blonk and double bassist Damon Smith. 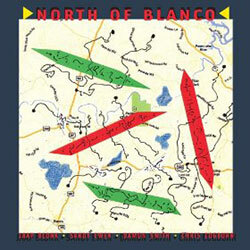 Six focused quartet improvisations with complex, independent layers of rich textures. 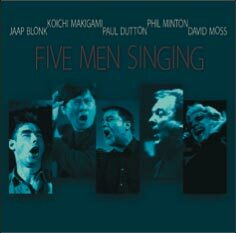 Featuring Dutch vocalist/sound-poet Jaap Blonk and three Texas improvisors: Damon Smith (bass), Sandy Ewen (guitar & objects), Chris Cogburn (percussion). 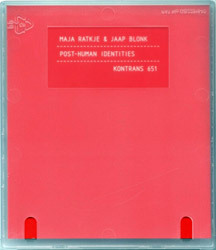 Loose remixes of Jaap Blonk's very first series of short sound poems in 1993, "Liederen uit de Hemel" ("Songs from Heaven," 1985-87), reconfigured with electronics and unusual approaches to sound. 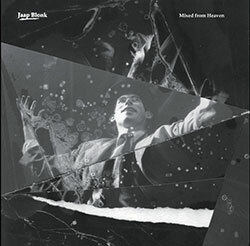 Legendary improvising vocalist Jaap Blonk in a solo work, a mesmerizing and hallucinating piece of electronic music presenting myriads of voices and melodies that never repeat themselves. 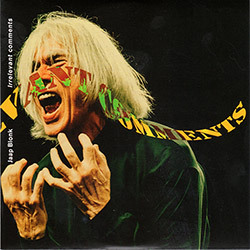 Thirteen tracks by Avant vocalist Jaap Blonk using unusual techniques and electronics in his own original compositions and works for Thelonious Monk, Dylan Thomas, etc. 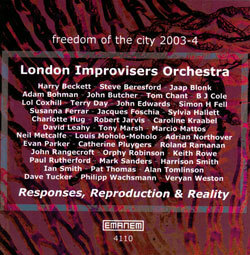 A series of improvised performances with the central idea of acoustic and electronic artists experimenting with the electronic medium in a live setting with musicians with whom they have never played with before. 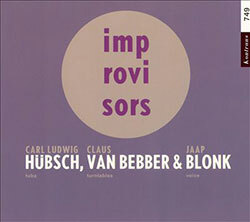 Improv meeting with Dutch master vocalist Jaap Blonk, turntablist Claus van Bebber and Carl Ludwig Hubsch on tuba.